IT’S NOT EVERY DAY THAT BIG-NAME theater producers offer $2.5 million to stage a young artist’s first major show. But that’s exactly what happened to Lin-Manuel Miranda ’02 and the creative team of In the Heights, a vibrant, groundbreaking off-Broadway musical that opened in February and heads for Broadway next season. The well-reviewed show features an exuberant score written by Miranda, who also plays one of the lead roles, and has been skillfully directed by Thomas Kail ’99. The musical appears to have been blessed since its first incarnation at Wesleyan at the ’92 Theater in 2000. In the Heights deals with the lives and loves of the residents of a block in the Latino neighborhood of Washington Heights in northern Manhattan. The musical follows a number of likeable characters during a Fourth of July weekend, including Usnavi (played winningly by Miranda), who is the owner of the local bodega, a regular hangout for the residents; Nina, a 19-year-old who has just returned from her first year at Stanford; her parents who own a local car service; Benny, a car dispatcher who has a crush on Nina; and Abuela Claudia, Usnavi’s surrogate grandmother, who buys lottery tickets, dreaming of a better life. Most of the characters spanning three generations are immigrants from the Dominican Republic, Cuba, Puerto Rico, and other Latin American countries who have a love-hate relationship with their neighborhood and often idealize the country they left behind. In the Heights stands out as an anomaly in the history of American musical theater because so few musicals have focused on Latin American life at their center. The classic West Side Story is one of the few high-profile musicals featuring Puerto Rican characters in principal roles, and that opened in 1959. Miranda was inspired by memories of growing up in Inwood, near Washington Heights, as well as by more recent observations of the area. Over the decades both Inwood and the Heights have been home to generations of immigrants from the Irish, Italian, and Jewish communities in the early 1930s and ’40s to the Cuban and Puerto Rican residents in the ’40s and ’50s. The latest influx of immigrants has come predominantly from the Dominican Republic and a few other Latin American countries. What hasn’t changed in Washington Heights since Miranda was a young boy is the sound of music playing in every bodega and supermarket. Growing up, Miranda was attracted to different kinds of music and they all influenced his score for In the Heights. Two of his Spanish-language songwriting heroes are Ruben Blades and Juan Luis Guerra. He particularly admires Guerra’s ability to tell stores and inject political messages while he keeps his melodies upbeat. A few numbers in the show might be considered tributes to Guerra, such as “96,000” in which several of the characters consider what they would do if they won the lottery, and “It Won’t Be Long Now,” in which one character, Vanessa, expresses how she’s suffocating and longs to escape the neighborhood, all to an upbeat melody. Miranda inherited an appreciation of Broadway music from his parents, both from Puerto Rico, who listened to albums such as Man of La Mancha, Fiddler on the Roof, and Camelot when he was younger. His father, a community organizer and later a political consultant, is a huge fan of Debbie Reynolds and her starring roles in several Hollywood musicals, including The Unsinkable Molly Brown. Miranda says he has inherited from his mother, a psychologist, a tendency to cry after hearing heart-rending Broadway songs. Miranda also became a student of hip-hop lyric writing while he was growing up, fascinated by the rap sounds of such artists as Pharcyde, Outkast, and Big Pun, the first Puerto Rican rapper to go platinum. Miranda wrote his first musicals in high school. He commuted to Hunter College High School on the Upper East Side, where he learned music theory, appeared in several shows, and directed a production of West Side Story. Most of his friends at Hunter were white and Jewish or Asian American. In eighth grade, he was given an assignment to teach sections of Chaim Potok’s novel The Chosen.He composed songs for each chapter of the novel. In his sophomore year at Wesleyan, he applied to Second Stage to put on a show called In the Heights, even though he only had written one song. He was granted space at the ’92 Theater for the weekend of April 20–22. Miranda worked on the show nonstop during winter break. He tried to write the kind of show he’d want to be in. “I put in all the things I’d always wanted to see onstage: propulsive freestyle rap scenes outside of bodegas, salsa numbers that also revealed character and story,” he says. Miranda believes that an important experience that encouraged him to write the show was living at La Casa de Albizu Campos during his sophomore year. This early incarnation was an 80-minute one-act with 14 songs. A CD of the songs was recorded beforehand for the cast to sing to because all the campus musicians were involved in a Wesleyan Millennium Concert. Several of the characters would be carried over to later versions, but the main story focused on a love triangle, which would not appear in the off-Broadway production. The show was a hit on campus, and Miranda noted then how audiences were particularly riveted by the hip-hop numbers. Two audience members who were impressed by the show were seniors John Buffalo Mailer ’00 and Neil Stewart ’00, who told Miranda that they planned to start a production company after they graduated. Mailer suggested they would help bring the show to New York. Miranda wasn’t sure how seriously to take their comments at the time, but in his senior year, Mailer and Stewart returned to campus (along with friends Thomas Kail and Anthony Veneziale ’98) to see a production of his senior thesis. They were still very interested in his work. As it turned out, Mailer indeed founded Back House Productions with Stewart, Kail, and Veneziale. Miranda met with Kail in summer 2002 at the Drama Book Shop on West 40th Street in Manhattan, where Back House had established a small black box theater. Kail explained what he would do if he directed it. “Tommy was so smart about what he wanted to do. I agreed with him on almost everything,” Miranda says. Kail was a history major at Wesleyan and hadn’t been involved in theater, except for taking a script analysis class. Then in his junior year, he helped Veneziale direct a show and later that year went to Dartmouth on the 12-College Exchange Program, where he heard the great American playwright August Wilson give a lecture. In his senior year, he codirected with his friend Stewart a production of Feiffer’s People (by Jules Feiffer P’07) with a 12-person cast. It proved a very popular play at ’92 Theater and whetted his appetite to continue directing. After he graduated, Kail worked at the American Stage Company in Teaneck, N.J. When he wasn’t busy there, he would rehearse another show he was directing, which involved several of his Wesleyan friends. That was how Back House Productions started. Back House presented the first five readings of In the Heights, with Kail directing. The show received more attention in the theater community with each presentation. The first big-time producer to attend a reading in 2002 was Jill Furman, one of the producers of the successful Broadway musical The Drowsy Chaperone. She expressed interest in producing a larger production of the show, and she was later joined by Kevin McCollum (who went to a 2003 reading) and Jeffrey Seller, who produced the hit Broadway shows Rent andAvenue Q, which had both won the Tony Award for best musical. As the readings moved forward, it became evident that Miranda had enough on his plate working on the songs and acting in the show, so a new writer was hired in 2004 to work on the book: playwright Quiara Alegria Hudes, who had a similar background to Miranda’s. “One of the things that Quiara was great at was bringing out the different flavors of the community, its ebb and flow and its struggles. She made the work much more about the neighborhood and characters living in a larger place,” Miranda says. As revisions continued, the character of Usnavi, the bodega owner, played by Miranda, became larger and more central to the story. Miranda played the character at various readings and workshops because there wasn’t enough time to teach someone else the intricate raps in the song lyrics. Those involved with the show thought they would recast Usnavi when they had more time but the composer never stopped playing the part. Miranda’s comfort on stage is not a total surprise: He played Jesus in Jesus Christ Superstar during his senior year at Wesleyan. A significant character added in rewrites is Abuela Claudia, Usnavi’s surrogate grandmother, who hopes to purchase a winning lottery ticket from the bodega. The character was based on a real person, Edmunda Claudio, a five-foot-one, 220-pound older woman from Puerto Rico who helped raise Miranda and his sister when his parents had to go to work. One of her passions was playing the slot machines at the back of the local bodega. As a child, Miranda used to pull the arm of the machines for her. “I could do no wrong in her eyes. She gave me unconditional love,” Miranda says. The character inspired Miranda to write “Paciencia Y Fe” (“Patience and Faith”), a powerful number for her to sing about her homeland, which was the hardest song for him to write and the one he is most proud of. He wanted to tell her story as accurately as he could, and he did research on Cuba and New York in the 1940s and ’50s. The show was performed in workshops at the Manhattan Theater Club and at the 2005 Eugene O’Neill Theater Center in Waterford, Conn. The next step was a full-fledged production. The producers, as proof of their commitment to the work, put up a $2.5 million budget, very generous for an off-Broadway show. McCollum and Seller were part owners of a 499-seat theater, 37 Arts, at 37th Street near 10th Avenue, and the musical opened there in February 2007. As the director, Kail often had to play the role of the editor. The musical was on a much larger scale than anything he had worked on before. The challenge for him and the rest of the creative team was figuring out which stories were the most potent to tell, and how to simplify and streamline them to maintain the authenticity of the storytelling and the integrity of emotion within scenes. Kail worked closely not only with Miranda but with the choreographer, set designer, and the rest of the production team to create an authentic version of Washington Heights on stage. 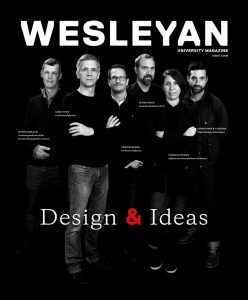 (Another Wesleyan graduate, Bill Sherman ’02, the co-arranger and co-orchestrator, played an important part in shaping the score.) He also had a large cast of 22 actors, which included seasoned veterans and up-and-coming fresh faces. For Kail, this meant 22 different relationships because each of them brought something unique to the production. A few reviews pointed out that the show sidestepped the existence of crime and drugs in Washington Heights. Miranda says that was a conscious decision. “Anytime I’ve seen Washington Heights in a movie, there’s always a drug deal taking place. And there have been two Broadway musicals that have featured Puerto Ricans prominently—West Side Story and The Capeman—and both of them have gang members in the ’50s with knives,” he says. Now that Miranda and Kail have found success off-Broadway, they have a new challenge ahead of them. In late May, the producers of In the Heightsannounced that the musical will transfer to Broadway during the 2007–08 season. It will close off-Broadway mid-July so that the entire creative team will have time to prepare and revise the musical with a bigger budget for a larger theater. “We have learned a tremendous amount during our run off-Broadway,” Kail says. The interim period will allow Miranda to work on songs again, which he hasn’t had much of chance to do while performing eight shows a week.